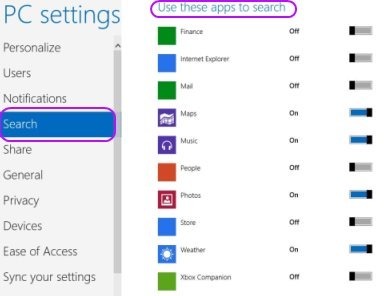 Here is tutorial on how to customize search apps in Windows 8. Customizing search apps is not a tough task. Make your search pre-defined with an appropriate search results. Microsoft’s Windows 8 comes up with bundle of pre-installed applications and a few more for installing from Windows 8 Apps Store. Now, we usually type a word to search one from among the plenty. However, it shows up many applications related to the typed word, then again you look for the exact application. This is time-consuming. Hence, to overcome such issue you need to customize search apps in Windows 8. 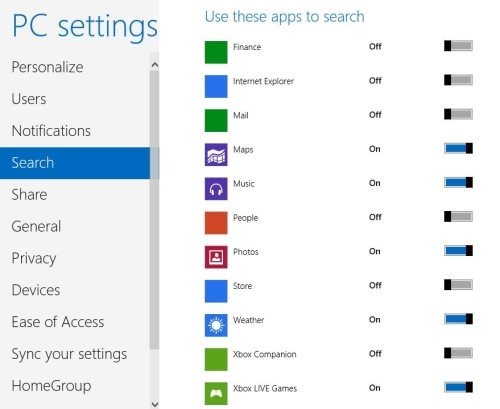 Lets check out how would it be possible to customize search apps in Windows 8. You can easily customize the required apps and trim down the list for an appropriate and better search process. Do not miss out our post on 4 Must Windows 8 tutorials. First of all, you need to launch the “Charms Bar”, by pressing Windows key+C. Click on “Settings” link and then further select on “More PC settings” link. Clicking on “More PC settings” will get you Windows 8 control Panel. 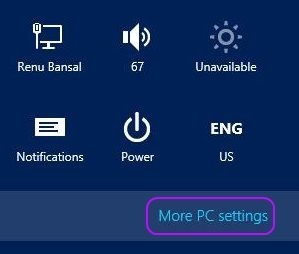 From the main “PC Settings” screen, scroll down and click on “Search” option. Now, change the sliders from “On” to “Off” to show or hide app on the search screen. The above given tutorial will work efficiently to help you customizing Windows 8 search apps and make your search pre-defined with trimming down, the unwanted apps from the search list.